"Hush, my child, ne’er say a word. I shall buy you gold-caged birds. I will buy you golden rings. It is a lullaby, a child’s song that originates back to our species earliest days. I find it entertaining that most view it as a song of a parent doing their utmost to please their child. What I picture when I hear this song is a spoilt child that can never be pleased. -Remembrancer Auria De Fuhmari, Attached to the III Legio. Yep. Yep yep yep. Big ole pile of yep. That sorcerer looks wicked. Is the orb for scrying or hurling? Loving the Sorcerer, looking forwards to what this will bring. The deadliest weapon ever devised by man, as shown by our esteemed brother Octavulg, the blessed Bowling Ball of smiting! That Sorcerer exudes menace without using hardly any Chaos parts at all, and that's awesome! Looking forward to more. Kudos on that sorcerer. I will be watching this project eagerly. Thank you everyone for the positive replies! Definitely glad that the sorcerer comes off a bit sinister without having to write a description! I am pleased with the pose myself, I originally intended his right hand to be reaching outwards BUT it looked like he was doing the Heisman. I want to say both really. In my mind I imagine it as the essence of the Aether harnessed. He can draw upon its power to aid in the summoning of daemons, in the casting of witchfire or placing curses upon his foes. The orb itself is not its true form but how his mind maintains it. Its substance is like liquid mercury which the sorcerer, upon many occasions, dips his hand into and pulls from the depth of the aetheric substance the hilt of the sword, followed but its guard, and its blade until the razor tip is pulled free and the orb has changed its shape and purpose by alchemical means. This all of course was the afterthought to my original idea of having him hold nothing at all. After reading about Diaboloist just harnessing the aether and watching the Scarlet Witch in the recent Avengers movie I thought it was a cool idea to have a sorcerer walking about and wreaking having with every wave of his hand. However, it just didn't look right. *further down you will see its business end thus far. Right now it looks like something a Tau would be proud of. As you can see I have it pictured with the Kakophoni’s main weapon…the…Cacophony. When FW first teased this unit I was in love and beyond ecstatic when I saw their weapons. I pre-ordered a unit and waited forever for it to get across the pond to me here in Jolly Ol’ Austin. I’ve mainly used these guys as my blastmasters in my NM squads and will one day have them used for their true Horus Heresy purpose. Why I am building my own blastmaster is a mix of inspiration namely from another user know as Zsoulless who was working on some fantastic stuff. Scroll through that thread of his and you will see what has my heart jumping. Below, you will even see something I tried copying from him. I am hoping to add a few finishing touches here and there to the BM and create another similar back pack to act as an amplifier for kicks and giggles. I love the Chaos Space Marine on the right, especially the bolt pistol that looks like it's made of metal vertebrae. Did you modify the weapon with green stuff, or does the model come with that? He comes like that out of the Dark Vengeance box. I wish I could sculpt haha. Oh that Blastmaster is off to a gorgeous start. It fits so well with the Kakophani's version of the Sonic Blaster. Cannot wait to see what you do with these, man. Look to the Heavens and count the stars. Only then can you begin to comprehend the quantity of my sins. III Legion. Traitor. Cult of Golden Tears. Howdy folks! After getting some gaming in and rocking back and forth waiting for F1 to start I got some work done. Thank you Noctus and kobrakei! The story of the Cult of Golden Tears is rife with lies and honors, truths and disgrace. To many they are hated enemies and friends to so few. No matter which side one finds themselves on the Cult of Golden Tears remain a threat as none can resist the desires that drive their lusts. Their history is vast yet near forgotten or lost but all stories must have a beginning. Some do not even know of the Emperor as he conquered Old Earth. How his Thunder Warriors served not only well in battle but as a bookmark of success in the lost art of gene-manipulation. From their glory and ashes came his finest warriors, the Space Marine Legions. Among them none were as perfect as the III Legion. They once stood proud and resplendent upon the battlements of the Imperial Palace. From him they took their name, the Emperor’s Children, and his personal heraldry as their own. It was an honor none could match. They would be cast into the stars to conquer them for their Emperor in his Great Crusade. They would suffer both tragedy and glory as they waged war. Some could argue that ink would run dry before any scribe or remembrancer could truly detail the honor and valor of the Emperor’s Children that would do render unto them the magnificence they deserved. However, all things change. 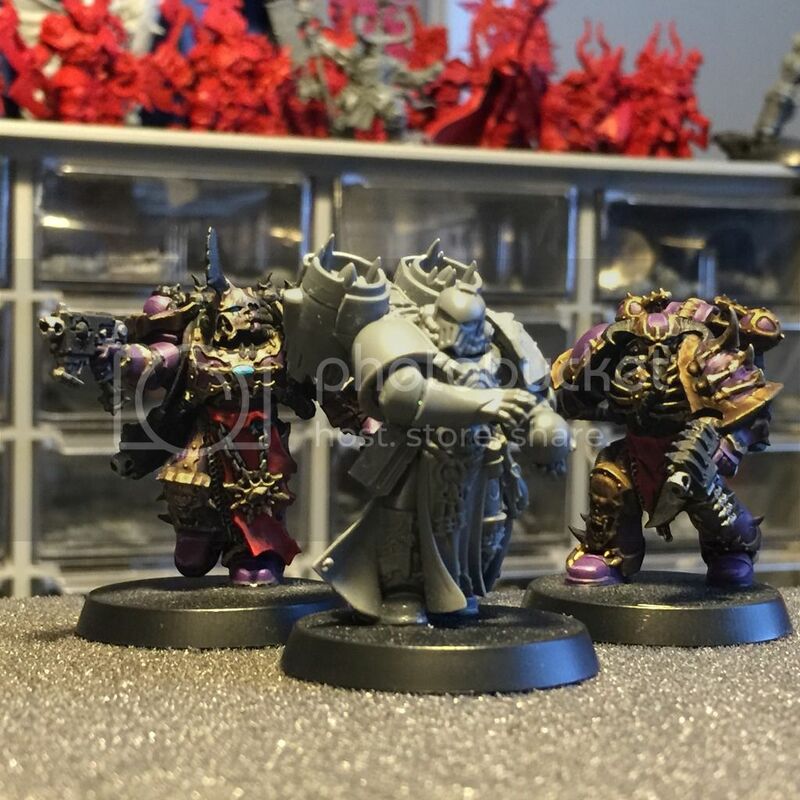 Upon the stage of Istvaan the Emperor’s Children revealed their true colors. The betrayal of their oaths and the massacre of their legion brothers forever marred their honor. Corruption took hold and the warriors who once stood proud and valiant had now fallen the furthest. They had cast their lot in support of the Horus Heresy. They would bring ruin to the Imperium they had built as they raced to tear down the Imperial Palace. Fate however did not favor them as they and their traitorous kin were repelled from Terra and hounded into the Eye of Terror. It is here, in their realm of nightmare vision and hell that the Legion had been shattered. Upon the anvil of Skalathrax they were broken and scattered. It is here the Cult of Golden Tears took its first breath. Running from the wrath of brothers a fleet of III Legion vessels sailed and endured the waves of the aether. Raiding and plundering from their kin to survive and slake their desires they were as crows upon the battlefield during the beginning of the Legion Wars. Their numbers were dwindling as well as their supplies. Their fleets of ships were broken things barely able to sail. It is in this time salvation was delivered. Within a region known as the Veil of Howls they had come upon the Broken Sun. The Veil of Howls was once system of planets known as the Gaul System. It should not have been within the realm of the Eye of Terror. Once an industrious hive and resource rich system it had been consumed by the raging warp storms that bleed into reality during the Horus Heresy. When the mighty storms retreated it dragged Gaul back with them. Three worlds, although inhospitable, support life even within the nightmare realm. Gaul Primus, once home to billions, has been ravaged by undergrowth. Enclosed within mighty fortress walls and vast hab-domes forests and vast jungles cover the surface of a world which had been a hub of massive hive cities. Their tallest spires can barely rival the strange, gigantic fauna that has grown from seeds of the warp. Life still dwells here but those of human origin find themselves prey to unnatural predators that hunt with great hunger. Vall had been the breadbasket for both the system and several crusading forces. Their agricultural might could feed untold billions with their rich soil and an army of farm-laborers. Now it is a dustbowl of arid, dry fields. With tragic irony millions who dwelt upon Vall died of starvation and thirst but it has not stopped them. Now their husk-corpses crack and crease as they rise to stumble through the vast nothingness in search of flesh to feast upon. The last had once been hollowed-out shell turned into a forge of the Mechanicum of Mars. Its previous name is lost to history and the Martian Adepts designation is a long winded sequence of zeroes and ones. Thus it is known as such to the Cult of Golden Tears and the few that are allowed within their perceived domain. Zeroes and Ones had been a marvel of technological wonders capable of producing machinery of industry and war. From hand tools to warships nearly nothing was out of their grasps. However, by means known only to the madness of the warp the world is now covered in ice. Though nothing but harsh winds stir upon its surface it is believed something still dwells within. However, what it could be remains unknown. Casting its shadow upon the surface of Zeroes and Ones orbits a ancient relic, a starfort from mythic times, the Broken Sun. The Broken Sun aimed the full might of its guns toward the ill fleet of the Cult of Golden Tears. The astartes mimicked with all the firepower their ships could muster. Every encounter in the warp and among traitors had ceased being the joyous celebrations of the past turning into standoffs with a show of arms. Hails and challenges echoed from the III Legion and they were met with the binaric code dialect of the Oscillating Eye. A coven of twisted Martian adepts and masters who laid claim to the region and the buried riches it contained. Each force could guarantee the destruction of their foe but at great loses. In this standstill, over the contemplation of a pyrrhic victory, the dialogued changed into negotiating. There would be no victor when each force could assure mutual destruction. Words, threats, and boasts finally formed a bond of symbiotic relation. The Oscillating Eye would provide arms, supplies, and a base to the legion warriors. In exchange the Cult of Golden Tears would add their fleet and warriors to the defense of the Broken Sun while also providing a force to raid and acquire much needed raw materials. Although coming to terms it is an uneasy alliance. However, it has held as the benefits have outweighed betrayal. With their ships repaired and their forces repaired the Cult of Golden Tears strike out from the Veil of Howls to reap sorrow and misery against anything that can bring them satisfaction. It's quite a bit so hence the spoiler tag. I am happy to finally share some fluff I had built up for this force years ago but never put down in words. Other than that I got some work on my physical army done. To start is a biker. My HQ is running on a bike and has a few riders with him. This fella is one of them. Nothing to fancy but I wanted to show a biker on an oval base. 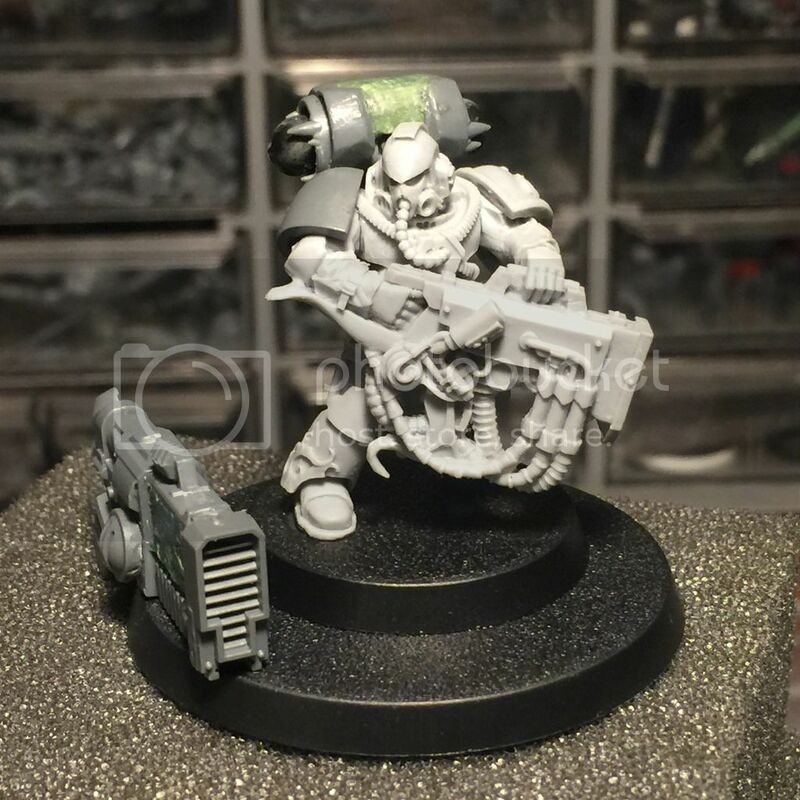 I was debating on whether I should or should not but then I saw the new White Scar Deathwatch rider. I was sold. Next up is something I am very excited about even though it is not in my initial 40k Army. It is a techmarine who will hopefully be receiving a wicked weapon and big, fancy backpack. In 40k I would like to run him as an Obliterator. The fluff idea being he and any like him are techmarines wanting to test out the potency of home made conversion beamers. I am only concerned if him being on a smaller base would be an issue. When I play HH he will be either backing up some armor or riding along in a storm eagle. Lastly, some more work on my Blastmaster/Cacophony. It's pretty much done but I would like to shop for some guitar wire. I always see it being used and I need to get some. As for that thing on the top handle I was happy to fit that in despite how bulky it is. In another bit of fluff I had a dial my noise marine used to change the frequency and power setting. That round deal on the top is how he does it. Anyways, off to do some stuff with the rest of my Sunday. Thanks for taking a look. The Mk III head looks fits well with the biker. 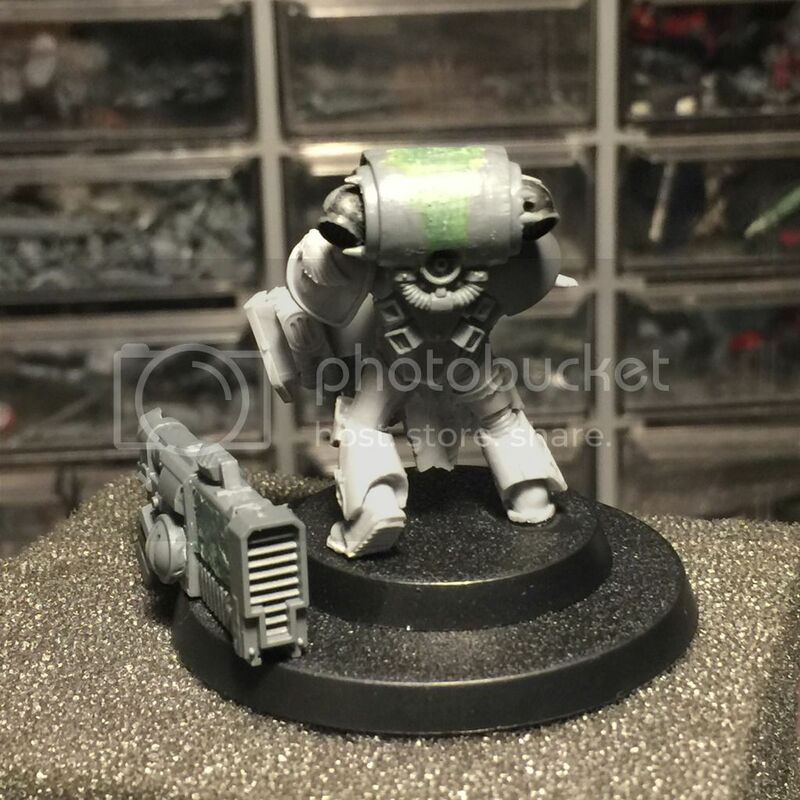 The techmarine looks great, where are the torso and legs from? The only setting you need on the Cacophony is 11. Awesome stuff buddy! absolutely love the conversions ya got so far! Thank you sir! That is high praise from someone who I have seen kitbash and convert the heck out of marines! 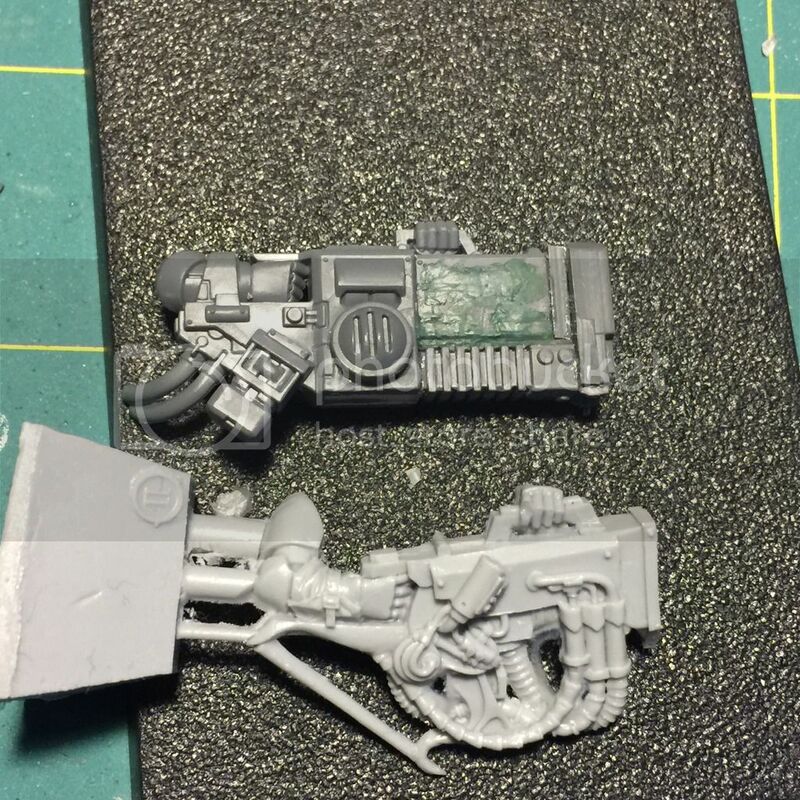 The body of the techmarine is from the Chaos Warpsmith from GW sans his mechantendril cloak and smoke stacks. I bought him when those first came out and I have scavenged him for bits. Soon he will come into his own I am happy to say. I'm hoping he can keep that effect going with this T-rex arms coming out of his torso. Oh man...just had a flash back of Quatto and his little torso arms. Haha, thank you! Actually, since you had let me name one of you Legionaires would you mind naming the Legion-Brother who will wield that cacophony in glorious battle? I'm almost done with Fortis. Where's that claw from on your techmarine? Obscura, Thank you, sir! I am also looking forward to seeing Fortis! The AM Kataphron Battle servitors. That pose on the sorcerer is pretty cool. Looking forward to see what you do with it.